Lake Louise, the famous Back Bowls of this world renowned ski resort continue beyond the boundary lines to offer great skiing in Purple Bowl, Redoubt Bowl, Hidden Bowl and The Tylenols, to name a few. 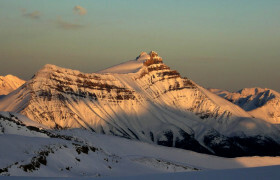 Wapta Traverse, Canada’s classic “Haute Route”. This hut to hut traverse crosses the expansive Wapta Icefields of the Canadian Rockies past majestic peaks with a remote feel although the next comfortable hut is never far away. - This course has less structured training than the Intro Ski Mountaineering Course and is aimed at folk already competent in the basic ski mountaineering skills. Whilst these skills will be revised during ongoing training throughout the course, the emphasis will be on getting some big journeys and great skiing done. - Provide an excellent spring board, at the start of the classic hut to hut touring season, for other challenging ski mountaineering trips in the spring. - Have an enjoyable and sociable week meeting up with other like minded ski mountaineers who you may end up skiing with again in the future. - Some sections of the ascent may require using crampons, the use of an ice axe and being roped up. Skiing includes many sustained 40 degree slopes. Minimum level required: level 4 in ski ability levels - fitness level 2. Cost: Euro 3700 per person. the cost include: services of Mountain Guides (one European Mountain Guide, one Canadian Mountain Guide), all transport in Canada as per program, lodging and hut fees, half board except lunches and evening meals in the city, group equipment, first aid kit for both the guide and yourself. The guide will book all Hotel and Hut accomodation for the tour – you pay for these direct as we we go along. Trip meeting point: Calgary Airport. Arrive in Calgary. You will be met at the airport and transferred in Hotel to Canmore a one hour drive from Calgary. Depart the hotel at 7.30 am for the 1-hour journey by private Landcruiser 4x4s along roads to the lake Louise ski resort. Lake Louise Resort is famous for its “Back Bowls” with steep skiing in deep powder but those back bowls keep going, ridge after ridge into the terrain that surrounds the resort, providing a whole lot of untracked goodness to be enjoyed. For the adventurous powder hound willing to earn their turns the rewards are plentiful. Stay five night in the village. Hwy 93 to Peyto Hut. The route starts from Peyto Lake with a good view of the long ski tour across Peyto Lake and then the gradual climb into the alpine. after the valley ascent at Peyto Glacier and from here to Peyto Hut which is outcropping below Mt. Thompson. Overnight at the hut. Duration: 5-6 hours. Peyto Hut to Bow Hut. From Peyto Hut the route ascends southwest onto the Wapta Icefield. Maintain your elevation and don’t get pulled to the west and descending onto the Bow Glacier to Bow Hut. Overnight at the hut. Duration: 3-4 hours. Bow Hut to Balfour Hut. The traditional route to the west of St. Nicholas Peak requires a steep 1000′ climb up the Wapta Glacier directly west of the Bow hut. Ascend the St. Nicholas Peak-Olive col and then it is a gentle ski down the Vulture Glacier to the Balfour Hut. Overnight at the hut. Duration: 4-5 hours. Balfour Hut to Scott Duncan Hut. The route to ascend the Waputik Glacier by heading west around a cliff band and gaining a wide bench and heading directly towards the Balfour High Col. From here ski down the Wapituk Glacier to Scott Duncan Hut. Overnight in the hut. Duration: 5-7 hours. Breakfast in the hotel. Return to the Calgary airport for the flight home. This new itinerary visits a country we know well to explore some of the highest mountains on skis. We aim to keep the itinerary fairly flexible to make the best use of snow conditions for ski-mountaineering, but plan to ski at least two 6000m peak after an initial phase of skiing several 5000m peaks. In April snow conditions are usually excellent and the surroundings are majestic and virtually undeveloped. We start with some superb day touring in the area above La Paz near at Huayna Potosi before attempting the 6000m ascent which, with the right weather conditions, is relatively straightforward with crampons and ice-axes required on the icy upper slopes. Dates 2019: 24 march – 07 april. Minimum level required: level 5 in ski ability levels - fitness level 4. La Paz – Sajama Village. Travel by road into Sajama village. Night in Lodge. La Paz – Huayna Potosi Hut. Travel by road into Plataforma de Zongo 4800m and from here walk up to the hut. 2 – 3 hours ascent walk. Overnight in the hut. Transfer to Airport for the flight home . This is a 10-day ski expedition into the heart of the mighty Caucasus Range. Nestled between the Caspian and the Black Sea, it’s a seriously wild place! The trip combines some excellent ski-touring with the possibility of an ascent of the highest summit in Europe – Elbrus (5642m). In April and May snow conditions are usually excellent and the surroundings are majestic and virtually undeveloped. We start with some superb day touring in the Adyr-Su and Baksan valley before attempting the Elbrus ascent which, with the right weather conditions, is relatively straightforward with crampons and ice-axes required on the icy upper slopes. Dates 2019: 27 april – 05 may. the cost include: services of two Mountain Guide (one guide is local), local transport as per program, lodging and hut fees except in Moscow, half board except lunches and evening meals in Moscow/Min Vody, group equipment, first aid kit for both the guide and yourself. The guide will book all Hotel as per program – you pay for these direct as we we go along. For more than 50 year history, skiers from different countries made big number of runs down the Lenin Peak slopes that still attract backcountry enthusiasts. One of singularities of this area is the variety of routs and tracks for climbing and skiing. With the right weather conditions, is relatively straightforward with crampons and ice-axes required on the icy upper slopes. 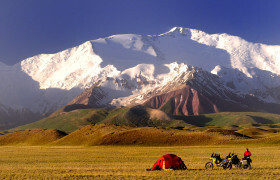 A popular 7,000m peak in the Chinese Pamir and excellent preparation for an 8,000er. The huge dome of Muztag Ata offers experienced ski mountaineer a chance to climb an exceptionally high mountain by a very straightforward route. Dates 2019: 14 july – 12 august. Minimum level required: level 6 in ski ability levels - fitness level 4. 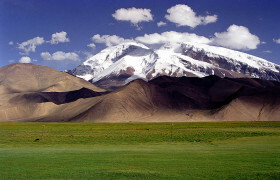 A visa is required for entry into Kyrgyzstan and China. This should be obtained in the your state prior to departure. PLEASE NOTE: obtaining a Kyrgyzstan and China visa is a long tedious process and needs to be done well in advance – we suggest at least 6 weeks and attention to detail when completing the on line form is essential to avoid any unnecessary delays. Invitations and vouchers will be supplied by Mountain Guides Expedition. If your budget allows, using a specialist visa company can make the process more tolerable. Northern Patagonia has a lot to offer backcountry skiers who want to go out for a few days, and our mountain guides know the extra special spots! Skin up, enjoy the great views of the Andes Mountains, and ski down leaving fresh tracks. Alpine ski touring the Huts of Bariloche, Argentina with a mountain guide is the ultimate trip combining Refugio Frey, Jakob, Laguna Negra, and Lopez. You get to backcountry ski a lot of remote Patagonia with the comfort of having the mountain huts to stay in. This ski traverse has some serious exposure, and conditions have to be right to do it. Dates 2019: 31 august – 14 september. Minimum level required: level 4 in ski ability levels - fitness level 3. Cost: Euro 2900 per person. the cost include: services of Mountain Guides (one European Mountain Guide, one Argentinian Mountain Guide), all transport in Argentina as per program, lodging and hut fees, full board in ski mountaineering except lunches and evening meals in the city, group equipment, first aid kit for both the guide and yourself. The guide will book all Hotel and Hut accomodation for the tour – you pay for these direct as we we go along. Trip meeting point: Bariloche Airport. Arrive in Bariloche via Buenos Aires or Santiago del Chile, just to the north of the Patagonia. The group will be met at the airport and taken to a local hotel. Ski day at the resort. Skiing hidden places of Cerro Catedral Ski resort. Having a nice short hike to the ridges, enjoying the view of the Andes, Cerro Tronador and the nearby lakes. In the afternoon, we’ll drive you to the hotel again and pack our gear to go for ski touring on next day. Daily ski trip to Cerro Bayo. Drive to Villa La Angostura 80 km. We need ski pass to access to good ski terrains. Excellent touring skiing terrain with options for beginners and experts. We have the option of going to ski to Chall Huaco as well, but we strongly recommend Cerro Bayo or Cerro Lopez. Ski mountaineering to Jakob mountain hut. 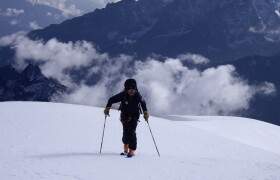 (6- 7 hours ski mountaineering in one day). We will go over Cerro Catedral ridge. 700 mts downhill skiing and then some valley crossing skinning up gradually to the top of Brecha Negra. Night at Jakob mountain hut. Ski Cuernos del Diablo. According to weather and snow conditions, we will ski Cuernos del Diablo (Devil´s Horn), which is the highlight of the area. Perfect mountain to ski. If conditions do not help we ski Cerro Cella or other nearby moutains. Jakob offer chutes and mellow terrain. Night in the Jakob mountain hut. Los Tempanos lagoon – Bariloche. Visit Los Tempanos lagoon from Jakob mountain hut. Then hike down to Casa de Piedra valley and after 4 Hs, we will arrive to the place where our transportation is waiting for us. Drive to the hotel. Bariloche rest day. We will take a rest day to relax and restore our energy luxuriating in Bariloche beautiful natural hot springs. Overnight at the Hotel. Otto Mieiling Hut – To Bariloche. Descend to Pampa Linda and return to Bariloche. Bariloche – Home. We transfer to the Bariloche Airport for the return flight to home via Buenos Aires or Santiago del Cile. Imagine a rolling landscape of forest and farmland with tumbling rivers and jewel-bright lakes, on the horizon a string of snowcapped volcanoes rising high above the surrounding countryside. Imagine skinning up at the base of one of those volcanoes, touring through native forest, ascending the mountain’s snowy flank and reaching its majestic dome, the imposing summits of a handful of other magnificent volcanoes on the skyline. – Spend more nights in a mountain hut allowing a good journey to be made and early start to complete a long tour. the cost include: services of Mountain Guides (one European Mountain Guide, one Chilean Mountain Guide), all transport in Chile as per program, lodging and hut fees, half board except lunches and evening meals in the city, group equipment, first aid kit for both the guide and yourself. The guide will book all Hotel and Hut accomodation for the tour – you pay for these direct as we we go along. The cost not include: Personal equipment, lunches, snacks and drinks, International flights Airport tax and entry visa (where necessary), Holiday Insurance (must include cancellation), Medivac (Medical & Emergency Evacuation) Insurance, telephone, any extra days waiting for weather and anything not specified. Trip meeting point: Santiago del Cile Airport. Local Airport: Santiago del Chile, Chile. Given that many of Chile’s volcanoes are catalogued as active, and some have erupted in recent years, We maintains options for ascents of alternative volcanoes and mountains should conditions prevent access to a volcano included in this tour. Santiago – Colorado. A local Mountain Guide will meet we at Santiago’s airport (please make sure that your flight arrives before 11:00 am). Following an optional stop at Ski Rental and Ski Shop for equipment supply we transfer you to the picturesque mountain village of Farellones, a trip of approximately an hour. After checking into the Powder Lodge we head out onto the slopes to review touring techniques and make final adjustments to our equipment. In the evening guides and clients go over plans for the tour. Overnight at the Powder Lodge in Farellones. Farellones – La Parva / Valle Nevado / Cerro Pintor. We ski tour the Cerro Pintor 13,713 feet (4,180m) near Valle Nevado and La Parva, get acclimatized to the elevation, and accustomed to our randonée equipment and to the Andean terrain and conditions. After skiing all day, we return to the lodge and soak in the hot tub. Overnight at the Powder Lodge in Farellones. Santiago – Vineyard – Termas de Chillán. Today we head south to our destination at the Termas de Chillán. We’ll travel through Chile’s wide, fertile Central Valley, planted with orchards and vineyards, a spectacular backdrop provided by the snowy peaks of the Andes mountain range to the east. We’ll break our journey with a visit to the famous Colchagua Valley, voted the world’s best wine region of 2005, with its neat vineyards, picturesque colonial architecture, and impressive mountain vistas. Continuing on to Chillán/Valle Las Trancas, we’ll reach our hotel and settle in. Ski Touring Chillán Volcano. We’ll use the Termas de Chillán ski lifts to reach the ski area’s highest point at 7,874 feet (2,400m). Here we set out for the summit of Volcán Chillán, a spectacular excursion with views of the steaming fumaroles, the high peaks of the Andes visible on the skyline. Following a full day of ski touring we return to our Hotel. Ski Touring to Nevados de Chillán. We will use the Termas de Chillán ski lift to reach the ski area’s highest point at 7,874 feet (2,400m). Here we begin our ascent of the beautiful glaciated peak Nevados de Chillán. We descend through the lovely Shangri La Valley with over 6 miles (10 km) of skiing and breathtaking views, finishing at Las Trancas valley. Overnight in our Hotel. Termas de Chillán – Manzanares. We drive 6 hours south towards Curacautín in the Araucanía region. On the way we stop to visit and photograph the majestic “Salto del Laja” waterfall. We settle into the Manzanar Hot Springs Hotel and then visit two more beautiful nearby waterfalls, “Salto del Indio” and “Salto de la Princesa”. Returning to the Manzanar resort, we will relax in the hot springs. 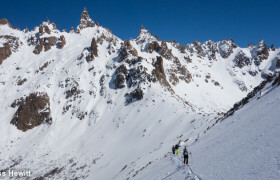 Ski Touring Lonquimay Volcano. We travel to the base of the Corralco ski area, located on the Lonquimay Volcano, the name meaning ‘dense forest’ in the Mapudungun language of the Mapuche people. We will make an ascent of this beautiful and accessible peak and from the top admire panoramic views of the region’s other stunning volcanoes. We return to the Manzanar Hot Springs Hotel. Ski Touring Tolhuaca Volcano. The Tolhuaca Volcano, so called because of its cow head shape, is located in the Tolhuaca National Park, a pristine wilderness area of outstanding natural beauty. We will ski tour the Tolhuaca volcano with breath-taking views over the beautiful Malleco Lagoon, an important waterfowl refuge. At the end of the day we return to the Manzanar Hot Springs Hotel. Ski Touring Llaima Volcano – Pucón. 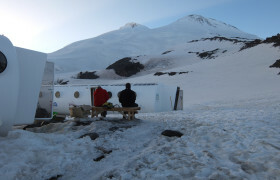 We will make an early transfer to Las Araucarias Ski Resort at the base of the Llaima Volcano. Considered one of the three most active volcanoes in South America, Llaima—which means ‘come back to life’ in the Mapudungun language of the Mapuche people—has had more than forty eruptions over the past 150 years, most recently in 1994. We will ascend and then ski down this impressive volcano with its vast crater, twin peaks with spectacular smoking fumaroles, and araucaria forests. At the end of the day we transfer to the Hotel Mallahue in Pucón. Hotsprings. We will take a rest day to relax and restore our energy luxuriating in Pucón’s beautiful natural hot springs. Overnight at the Hotel Mallahue. 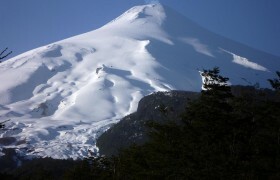 Ski Touring Villarrica Volcano. We start from Volcano Villlarica National Park, famous for its picture-book smoking volcano, considered the most active in South America, with its tumbling rivers, volcanic caves, and emerald-coloured lagoons. On our 5-hour ski tour, you will enjoy unforgettable views of this outstanding wilderness area. At the end of the day we will dine at one of Pucón’s celebrated restaurants and stay overnight at the Hotel Mallahue. Transfer to Huilo Huilo Biological Reserve. We visit this private wilderness conservation area and ecotourism project created in 1999 to protect 231 square miles (600 km2) of native forest, home to the elusive pudu, the world’s smallest deer. We visit the scenic Salto Huilo Huilo and Salto el Puma waterfalls and settle into the Montaña Magica Hotel. Ski Touring Mocho Volcano. We ski this beautiful volcano located in the Mocho-Choshuenco reserve, which covers more than 29,000 square miles (7,537 hectares) of wilderness. Its twin cones tower above native forest intersected with rivers and dotted with Andean lakes. We return to the Montaña Magica Hotel for the night.